Security Memetics: Best According To Whom? 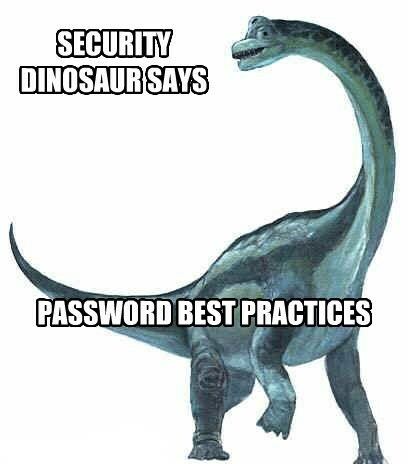 Over and over again I hear about password best practices, but invariably they turn out to be practices from the last century and as such are no longer anywhere near best anymore. What's worse is that everyone's idea of what constitutes best practices for passwords is a slightly different variation of the decades old advice. There is no agreement on what constitutes best practices so the term "best practices" doesn't even refer to a definite, well defined thing. What we now know about passwords is this: 1) generated passwords are stronger than chosen passwords, and 2) recording passwords scales better than remembering passwords. Password managers cover both of these facts. And Let Facts Get In The Way Of My Vendetta? You Wanna Stop Going Down? I Wonder What They Think Bitcoins Look Like? Do You Think They Learned Anything? Quick! Call The Fashion Police!